The line of Regalo baby gate models can meet almost any household’s needs. The Minnesota-based company produces several different style gates, including pressure mounted gates, hardware mounted gates, configurable gates, and freestanding playpens. 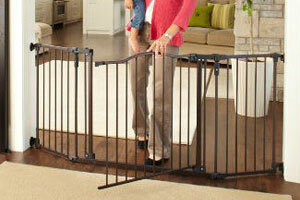 Non-standard sized gates are also a part of the Regalo baby gate family with extra tall and extra wide baby gates. Regalo has built a reputation of having high safety standards. Nearly all of their gates are submitted to the Juvenile Products Manufacturers Association and the American Society for Testing and Materials for testing and safety certification. View the comparisons of some of the most popular Regalo baby gates below to get a sense of the available models. As you can see from the chart, there are many different Regalo baby gate styles to choose from. Pressure mounted gates, swing gates, and playards are all available depending on which model best suits your needs. Below we’ll cover a few of these different models in more depth so you can decide what style of gate will best fit in your household. The Regalo Super Wide is a versatile gate. With a maximum width of 192 inches (that’s up to 16 feet!) it can span large distances within the home. It can also be used as a freestanding playard. Keep in mind that if this gate is used as an extra wide baby gate it needs to be hardware mounted to walls. The gate is composed of 8 folding, detachable 24-inch wide steel panels that are connected by pivoting joints. 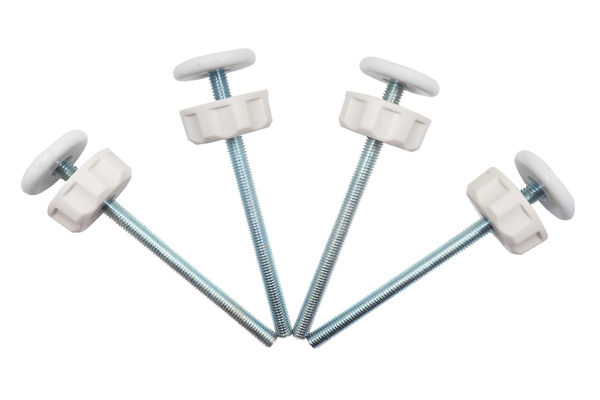 The pivoting joints make the gate configurable so it can be shaped to fit within the space you have. One of the gate’s panels includes an easy-open door with a safety locking feature. This is great for busy parents as it provides a no-fuss way to pass through the gate. 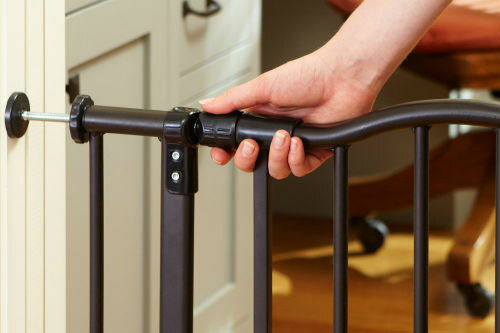 No stumbling over the top of this Regalo baby gate! Because the panels are also detachable you can take them off as needed, allowing you to enclose a space as small or large as you need. This makes the Super Wide a great fit for many applications, such as barricading stairway entrances or around the fireplace. 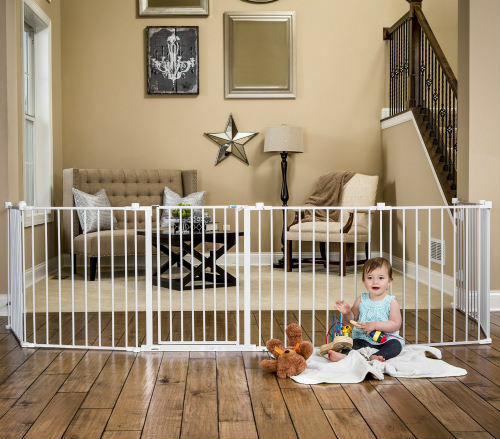 As mentioned earlier, the gate can also be configured into a playpen with an area of 19 square feet. 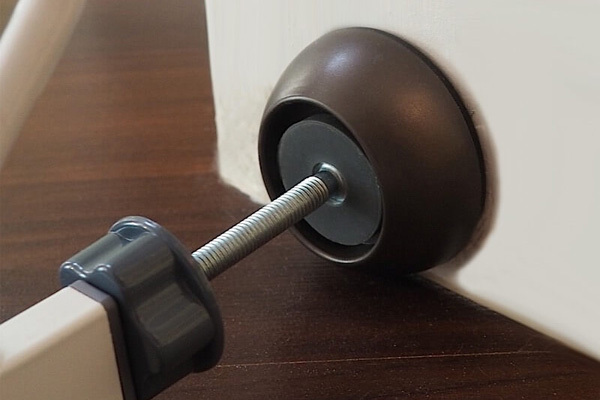 The gate comes with hardware to mount it to walls for a sturdy setup. Lastly, this model folds down into a small, easily portable little package for convenient storage. 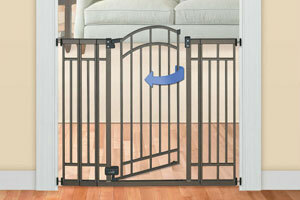 The Regalo Home Accents Extra Tall Walk Thru Gate is a pressure mounted model that blends style and function. 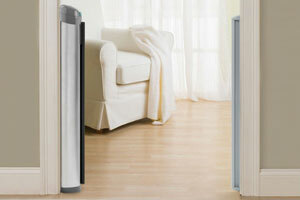 Before covering the details of this Regalo baby gate, lets go over the pros and cons of choosing a pressure mounted model. The benefits of getting a pressure mounted model include an easy installation process. 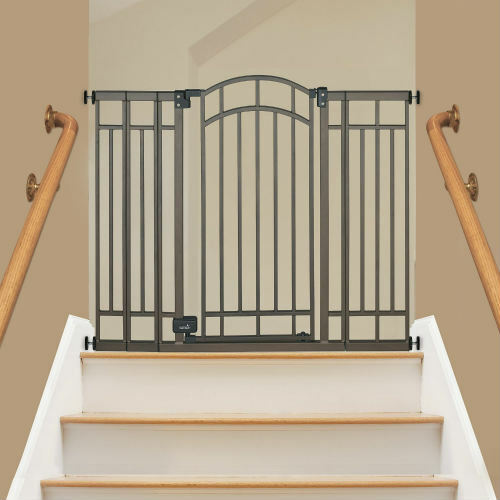 Because the gate is stabilized by adjusting spindles against walls, there is no hardware required to get the gate set up. A drawback to pressure mounted models is that they will not be configurable and can only span standard sized spaces. This gate in particular can span between 29 inches and 44 inches, which is wide enough to work for standard doorways and halls. A big selling point for this gate is its height. 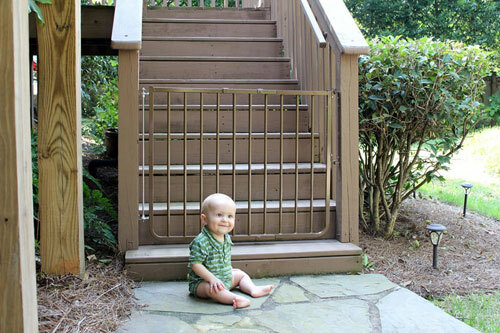 Standing at 38 inches tall, it is around 8 inches taller than the average baby gate. 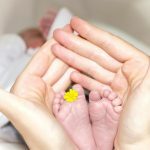 This means that little ones may be held at bay longer with this model. This gate also adds convenience with a walk-through door, as well as provides extra peace of mind with its American Society for Testing and Materials certification. 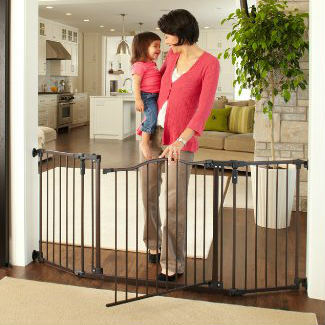 On top of the function of the gate, it is also on of the more stylish Regalo baby gates. It features a suave, black steel frame accented by Cherry Wood inserts. The Regalo Easy Step Walk Thru Gate is another pressure mounted model. 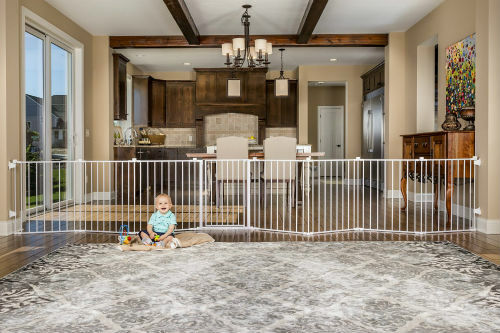 This gate is pretty standard and does not necessarily have any special features, but it has earned a 4.2 out of 5 star rating from reviewers and comes in at an affordable price. It can be adjusted to fit spaces between 29 and 39 inches wide. 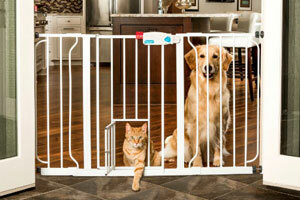 There is also an extension package that can be purchased separately that allows the gate to span up to 60 inches. This model stands at an average height of 30 inches tall. Like other Regalo baby gates, this model is certified PVC free and baby-safe by the Juvenile Product Manufacturers Association and American Society of Testing Materials. 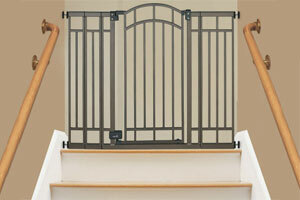 While this gate is nothing fancy, it is a safe, budget-friendly option that gets the job done.